George walked into the dimly lit room, bumped into the coffee table, tripped over the lamp cord, and fell to the floor. Sadly, George is in good company. A third of adults age 65 and older falls each year. 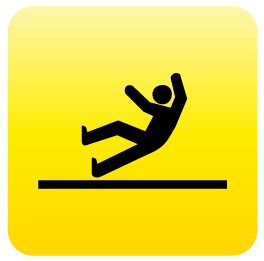 More than 2 million are treated in emergency rooms for nonfatal fall injuries annually. Almost $30 billion is spent each year treating fall injuries. But most falls are preventable. Aval-Na’Ree S. Green, MD, Geriatric Medicine, identifies some common fall risks. Knowing your fall risks can help you reduce your chance of falling. Generally, falls are caused by a combination of factors, says Dr. Green, some you can control and some you can’t. Any abnormality that makes your gait less stable can increase your fall risk, says Dr. Green. When you’re unsteady on your feet, you’re more likely to fall. The Number One modifiable risk factor for falls is medication. “For example, if you have hip or knee pain due to arthritis, you’re going to walk with a limp. Your body weight will be shifted abnormally. That will make your gait unstable and put you at risk for falls,” explains Dr. Green. Dr. Green says another problem could be with your nerves. “We call that neuropathy—where you can’t feel the floor beneath you, so you don’t have an opportunity to get that sensory feedback from your feet telling your body where you are in space,” says Dr. Green. “Vertigo—or dizziness—will also affect your fall risk,” Dr. Green says. Vertigo can be related to allergies, as your inner ear is important for balance and equilibrium. Inflammation in your inner ear can result in imbalance. The Number One modifiable risk factor for falls is medication, says Dr. Green. “A lot of the medications our elderly are taking are what we call vasoactive drugs. They can alter blood pressure and heart rate. They can also cause a decrease in blood flow to your brain, which will then cause you to feel dizzy and make your gait unstable, causing you to fall,” explains Dr. Green. Throw rugs. “It’s easy for people to trip on rugs or for their walkers or canes to get hung up on throw rugs that aren’t secure,” says Dr. Green. Low-lying furniture. “Coffee tables and other furniture that is outside your field of vision is easy to trip over, particularly if you’re visually impaired or have some cognitive issues,” says Dr. Green. Pets. “This is a sensitive subject, because people love their pets, but if you’re visually impaired and you can’t see as well as you used to, you might find yourself tripping over your pets,” cautions Dr. Green. Dim lighting. Inadequate lighting is a significant risk, Dr. Green says. Lamp lighting and 40- and 60-watt bulbs may be insufficient if you have some visual impairment. Bathrooms. “Bathrooms are huge fall risks because people are getting in and out of tubs,” says Dr. Green. People often slip on water on the floor and bath mats, too. Cracked sidewalks. Unlevel or cracked sidewalks create special danger for falling. Stairs and steps. Stairs and steps without railings or with railings in disrepair are dangerous for people who are unsteady. Shrubbery. Untrimmed bushes flanking your walkway can lead to falls. Dr. Green suggests you have a home-safety evaluation to help identify risks and offer solutions to help make your home a fall-free zone. If you have a fall, Dr. Green advises, it’s very important—even if you didn’t get injured—to tell your doctor that you fell. Your doctor needs to be aware of your full health history, including falls.